"Apple's Newsstand app, which premiered on iOS devices with the release of iOS 5, was designed to improve the sales of newspapers and magazines by giving publishers their own virtual shelf space in a highly visible app." 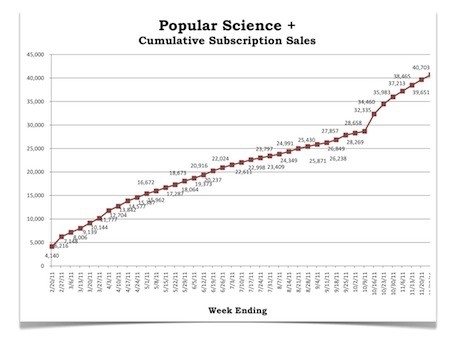 Popular Science certainly is feeling the success as shown in the graph above. I have done some purchasing through the Newstand app, but mainly I read my magazines via Zinio on the iPad. Where do you get your content?